Most isothermal microbial survival curves plotted on semilogarithmic coordinates appear linear, concave upward, or concave downward. This indicates that the underlying mortality probability rate is constant, monotonically falling, or monotonically rising, respectively. Other mortality patterns emerge when the mortality probability rate function has a peak or valley, in which case the resulting sigmoid curve starts with downward concavity and ends with upward concavity, or vice versa. 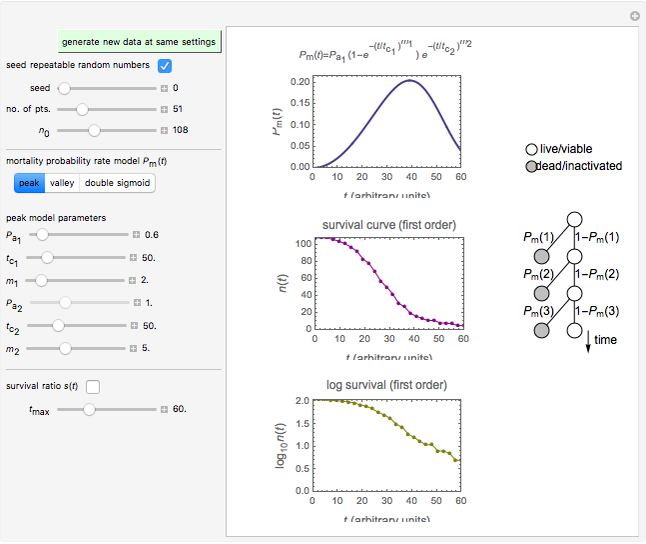 This Demonstration simulates such survival patterns, as well as monotonic but with two inflection points, using a fully probabilistic model where the underlying mortality probability rate function is constructed from combinations of two stretched exponential (Weibullian) terms. Consider a live microbial cell or viable bacterial endospore exposed to a lethal agent, be it heat, chemical disinfectant, ultra-high hydrostatic agent, radiation, and so on. We assume that the cell or spore can be in one of two states: alive/viable or dead/inactivated. In other words, growth, injury, recovery from injury, and adaptation do not occur on the relevant time scale. If a microbe is alive at time , , then after time step , it has a mortality or inactivation probability , where is the probability rate function at time 1, and a probability to remain alive or viable (see the diagram). After a second time step , which for simplicity remains of the same duration, the mortality probability is and that of survival is . Similarly, for the third time increment, the survival probability is , and so on. Assigning each time step a pertinent unit time, that is, , the survival probability after the time step is [1, 2]. 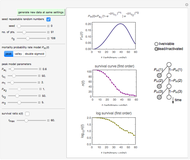 To create a discrete survival curve of a group of cells or spores, start by generating a random number , , and check whether . If so, the cell or spore is considered inactivated and the calculation stops. If not, then generate another and check if , in which case the cell or spore is considered inactivated and the process ends for that particular spore. If not, the process is repeated with new generated and until the cell or spore dies out. The same is repeated for all spores and the tally is recorded. The discrete survival curve is the sum of the number of living cells or viable spores at time units 0, 1, 2, 3, and so on. This Demonstration lets you select three model types with a setter bar. The models are all combinations of two stretched exponential (Weibullian) terms and are displayed above the plot at the top. They generate curves with a peak (type I), valley (type II), or monotonic with two inflection points (double sigmoid, type III), which most likely indicates a mixture. 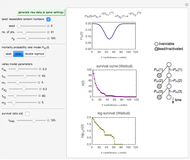 Using sliders you can select the seed for the random number generation, the number of points to be generated, the initial number of living cells or viable spores , and the parameters of the probability rate function . The parameters are , , , , , and , where and are the terms' asymptotic levels, and their characteristic times (arbitrary units), and and the corresponding "shape factors" that control the steepness of the rise and decay. The program then plots the probability rate function and, below it, the corresponding survival curve on linear and semi-logarithmic coordinates. 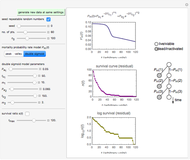 The Demonstration shows how certain shapes of the underlying mortality probability rate function , that is, with peak, valley, or two inflection points, affect the overall shape of the survival curve of small and large microbial populations. 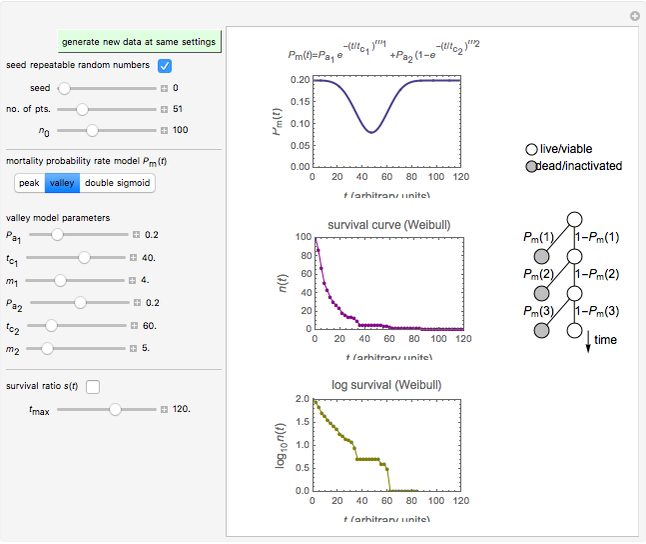 Not all parameter combinations allowed by the Demonstration necessarily have a match in the microbial world, but the Demonstration does show, in agreement with other reports, that as the number of cells or spores in the population increases, the survival curve simulated by the stochastic model becomes smoother and more deterministic. J. Horowitz, M. D. Normand, M. G. Corradini, and M. Peleg, "A Probabilistic Model of Growth, Division and Mortality of Microbial Cells," Applied & Environmental Microbiology, 76, 2010 pp. 230–242. M. G. Corradini, M. D. Normand, and M. Peleg, "A Stochastic and Deterministic Model of Microbial Heat Inactivation," Journal of Food Science, 75, 2010 pp. R59–R70. 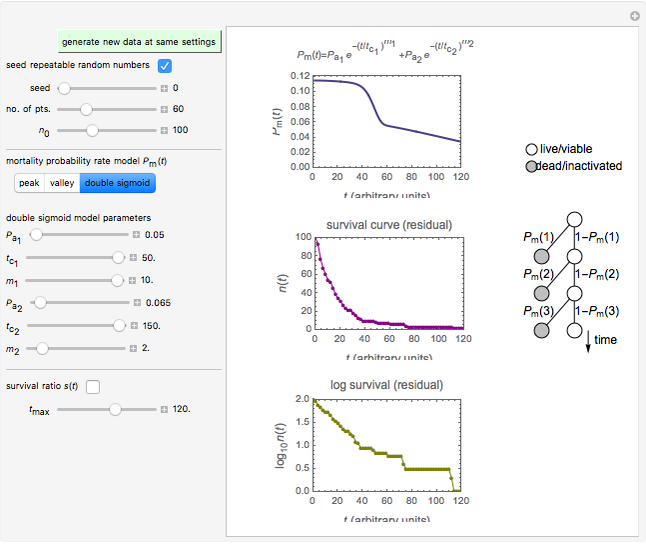 Mark D. Normand, Micha Peleg, and Zack J. Rosenthal "Probabilistic Model Showing Sigmoid Semilogarithmic Survival"